Creating an email list is a common marketing strategy used to be able to communicate directly to your readers and potential clients. Most private practices have a website and social media accounts, however, these avenues don’t provide you with the most efficient way to effectively communicate with your potential clients and readers. Your website relies on the possibility of readers remembering to visit your website. Social media provides the opportunity to send out contact to subscribers, however, most social media platforms now restrict the effectiveness of your message being read by all of your subscribers in the hope that you will pay for advertising to improve your reach to your readers. In addition to this limit of reach, you are also depending on another business who may restrict your access or even delete your account if they believe you have not met their terms and conditions. For therapists, this can be a real possibility given the sensitive nature of the services provided. If your account is removed or limited, then you lose access to being able to market to your potential clients. Having your own email list gives you more control over how you collect the details of your potential clients as well as how and when you choose to communicate with them. Choose an email service – there are a number of free and paid options depending on your email list size and complexity of the features that you want to use in your email marketing. Establish a plan for collecting email addresses – You need to ensure that you provide an enticing offer that will convince your readers and potential clients to sign up to your list. The process should be easy so that your client is not deterred by a difficult sign up process. 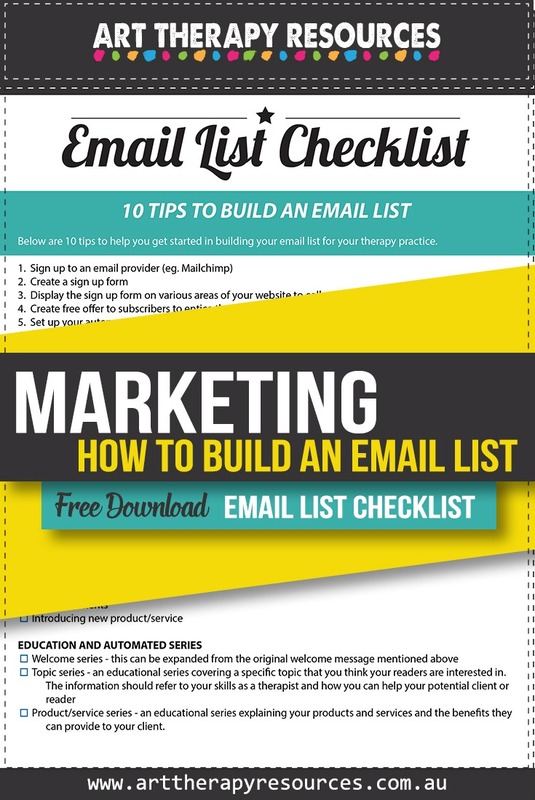 Using your email list – create a strategy on how often and in what format you will communicate to your email list. Will you communicate daily, weekly, monthly? Will you communicate using a conversational email letter style or through a formally designed newsletter format? The primary goal of any email list is to keep your readers interested and engaged (clicking links) in your email content. Once you sign up to an email provider you then need to establish an effective strategy on how to communicate with your readers. This entails setting up an email sequence. An email sequence is a series of emails that you send to your list that might cover a specific topic or series of information about your private practice. Creating an email sequence provides you with a structure to communicate with your email list so that you don’t have extended periods of time where you haven’t communicated with your email list. Having an email sequence also helps guide your readers through your website and important information about your private practice. Regular contact with your readers means your readers stay aware of you and how you can help them. 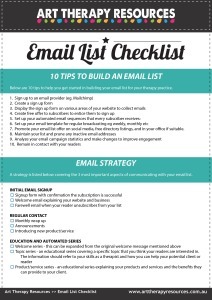 This strategy is detailed further below showing a variety of email sequences you can create for your practice. Welcome series – this can be expanded from the original welcome message mentioned above. Topic series – an educational series covering a specific topic that you think your readers are interested in. The information should refer to your skills as a therapist and how you can help your potential client or reader. Product series – an educational series explaining your products and services and the benefits they can provide to your client. It is a great achievement to get your email list signup form on your website and set up your relevant email sequences. Once these parts are set up, you then need to promote your email list and the benefits that readers can gain from joining your email list. You can promote your email list using a variety of different marketing techniques including free offers such as templates, worksheets, audio files, videos, free courses, guidebooks, and workbooks. Ideally, your free offer should be accessible to your new email subscriber immediately so they can be instantly connected with your content. You can provide free offers that are provided at a later date such as physical items shipped in the mail or a free introduction call with you on the phone, however, items that have a waiting period attached to them are usually less enticing for potential new email subscribers. Once you have created your free offer, you should include it on your website on a number of different pages. Not everyone will land on the home page of your website each time. As people find your website through search engines and social media, they will often land on specific pages or blog posts on your website. These pages and blog posts should always include a sign-up link to your email list. Once everything is in place, remember to promote your email list and the free offer on social media and other free listing pages where possible. Make sure you include details about what the reader will receive by signing up to your email list. You can also include a sign-up list in your office for those clients who want to sign up to your email list. Now that your email list infrastructure is set up, you are ready to create your email content to send to your email list. Choose topics that relate to your readers/clients. If you specialize in helping clients with anxiety, create emails that focus on anxiety. Set up a template for the regular emails that you send out so that you only need to update specific sections of the email instead of creating an entirely new email each time. Create a schedule for emailing your list. This could be every time you post an article on your blog or a weekly or monthly schedule. You may need to experiment with the length and frequency of your email so that your readers stay engaged with your content. Regularly include content and offers for your readers that are free. This will remind your clients that you are there to help them and not solely market your services to them. Once you have created your list and it starts to grow, you will need to undertake some simple maintenance of your list. This will ensure that your list remains an active list full of engaged readers who want to receive your content and regularly read the emails that you send. Most email providers provide a number of analytical tools to help you analyze the effectiveness of your email communication. These statistics will include details on email addresses that are no longer working as well as statistics on whether your emails are being opened and links within the email are being clicked. You can use these statistics on open rates and click rates to determine what your most popular emails have been and use that as a guide to write future emails. You can also run reports that determine if readers have not actively opened or read emails over a specific time period. As part of maintaining your list, you can run reports that provide this information and then contact only those readers who have not opened recent communications. You can then ask them to complete surveys to determine their interest in your content or ask them what kind of content they are looking for. If your readers don’t respond or actively engage in reading your content over time, you may choose to remove those email addresses from your list. This seems counterintuitive to some people who think building a large list is important. However, there is no point in having a large list if no one is reading your content or not purchasing your products and services. If you don’t maintain your list and remove unengaged readers, then you may find yourself paying for the privilege of having unresponsive email addresses on your list. This is not to suggest you have become uninteresting to your readers. It may be that a reader originally signed up to your list based on a single piece of content they read on your website at one time, however, they may decide that the content is not relevant beyond that original piece. Managing your email list is like any other digital storage where the content needs to be edited and managed so that it stays relevant to your needs. You can also download the checklist as an Evernote summary. You can access the Evernote Checklist here and save the note to your own Evernote account. You can also view the Evernote document even if you do not have an Evernote account. Evernote basic accounts are FREE. You can read more about Evernote in our blog post here: 10 Useful Tips to Use Evernote.